Reading other overland travellers’ tales, it seems that a visit to Kazakhstan is often included as part of a kind of ‘Stans collective’. Tales I’ve read tell of journeys north from Iran, through the various Stans to Russia. Because I was crossing Russia west to east, with planned visits into Kazakhstan and Mongolia but not any further south, I did not intend to visit any of the other Stans at this time. Kazakhstan is the world’s ninth largest country and is bigger than Western Europe. So pretty big then. It is also the world’s largest landlocked country. It is a former Soviet Republic and therefore has a large Russian population. In fact Russian is a second official language – useful to me having managed to learn some. Most Kazakhs speak at least some Russian. The country uses the Cyrillic alphabet although the two languages are completely different. But the Russian influence long pre-dates Soviet times, the country having been ruled by the Tsars since their expansionist activities in the 18th century. It was part of the territory that was fought over during the ‘Great Game’, played out between the Russian and British Empires. Russian settlers were encouraged to move to the country and the nomadic tribes were forced to adopt Russian languages and customs. 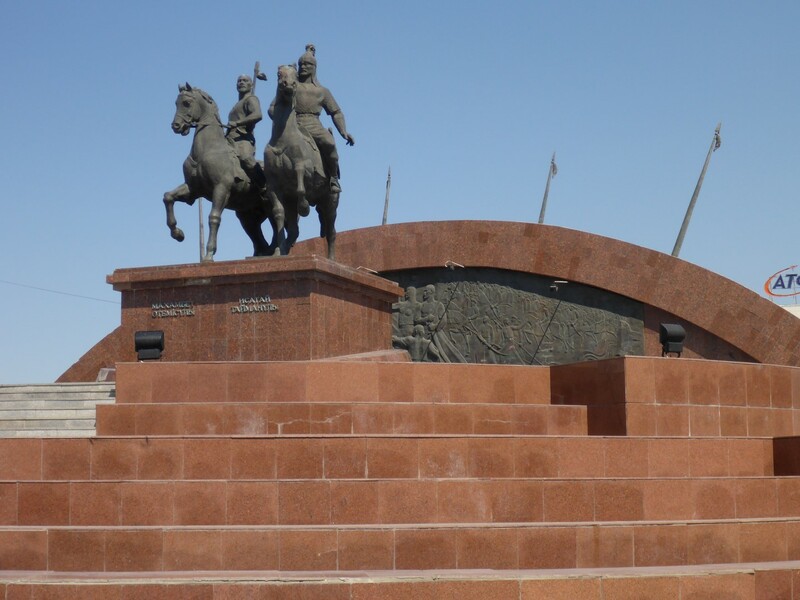 This led to a surge of nationalistic resistance in the mid 19th century, with violence against settlers and from settlers towards native Kazakhs. The resistance was an attempt to preserve the ancient nomadic and livestock based lifestyle, language and traditions, as well as being about water and land. Under Soviet rule the country suffered in the same way as many other Soviet Republics. Large numbers of Kazakh nationalists were sent to Siberia and even more Russians were sent to settle there, as were displaced persons from other parts of the USSR. Starvation was common and the native population dropped by nearly 40%. 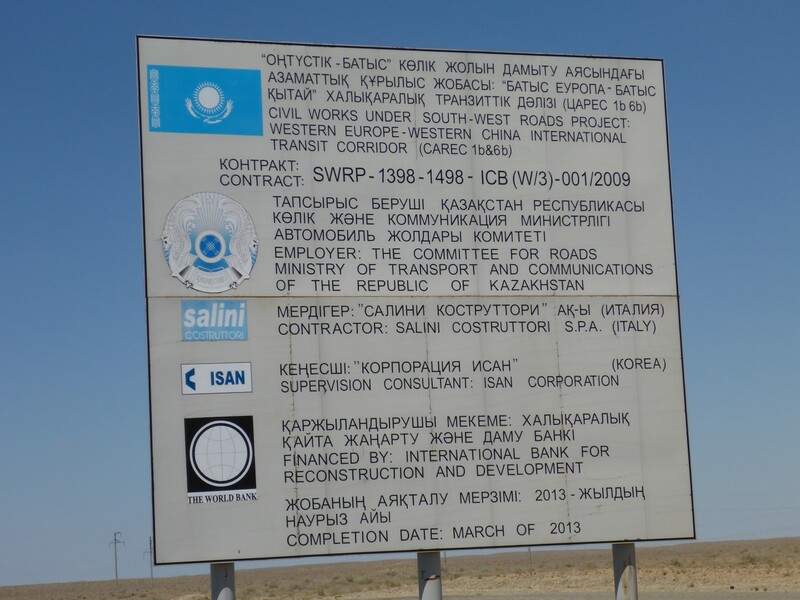 Kazakhstan has deposits of many different minerals, which were exploited by the USSR particularly during WW2. However, when Kruschev came to power he instigated a programme called Virgin Lands, the aim of which was to turn the northern steppe into a huge grain producing area. 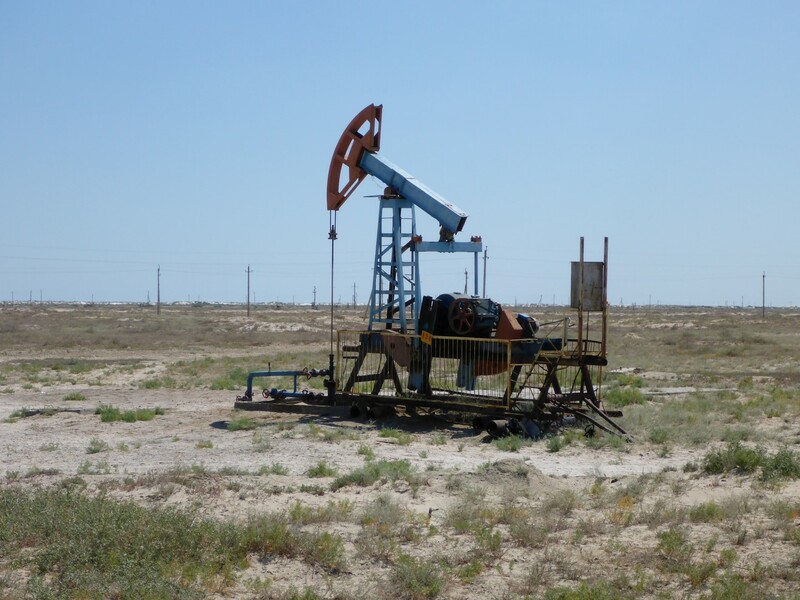 It had mixed results but it helped maintain Kazakhstan as a mostly agricultural economy. Along with the rest of the Soviet Republics, Kazakhstan gained its independence from Russia in the early nineties since when it has had, in theory at least, a freely elected government. Unfortunately it doesn’t have a very good international reputation for freedom of expression, media or elections. It also seems to like paying Tony Blair lots of money to enhance its reputation – a bit like asking the previous Pope to support an anti child abuse programme. As far as I was concerned though, Kazakhstan was a welcoming place, at least in terms of getting into it. I’d left the hotel without breakfast as there wasn’t anybody around to supply it. Arriving at the border I got through both sets of customs remarkably quickly. The two countries share a common customs regime, making things pretty simple. 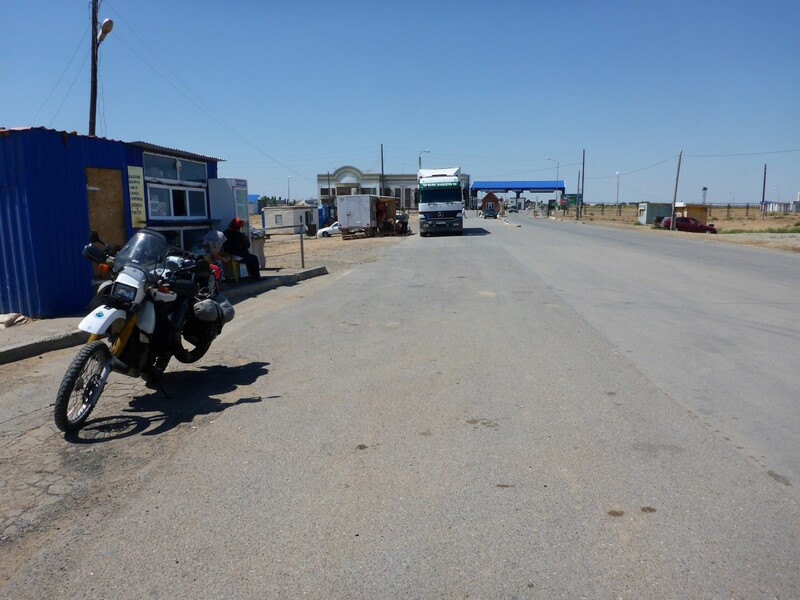 The border post was very quiet, two trucks, three cars and me. Speedy enough. Unlike the places I visited in Europe, there aren’t museums and castles to see, or many sites of historical interest. Kazakhstan has some natural beauty to explore but in many ways my thrills were going to be gained from simply being there. My loose plan was to head south to Almaty, the city in the south of the country that used to be the capital. In 1998 it was decided to move the capital northwards, closer to Russia, to the city of Astana. 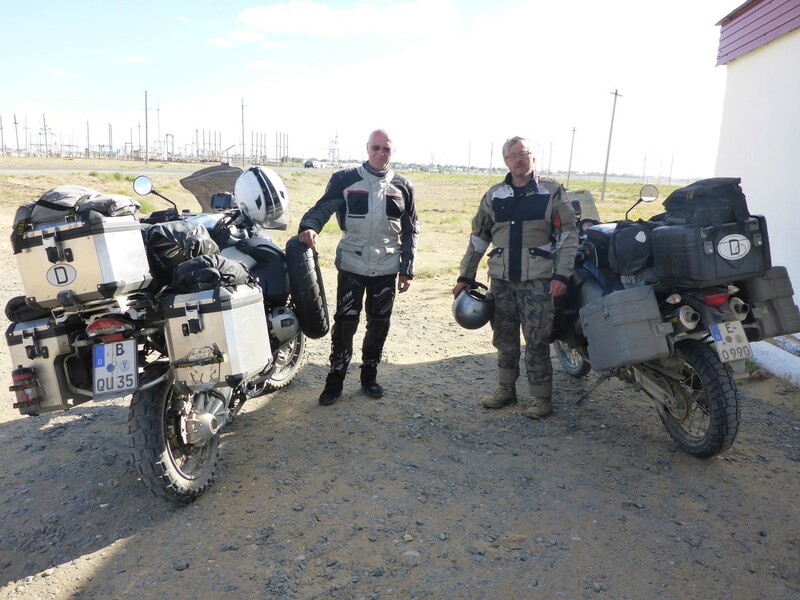 After Almaty my plan was to loop east and then north, to Astana where I had a contact. A friend of Andrey, my Moscow friend, lived there and I planned to visit him. We’d been in touch via Facebook and he was ready to play the host. After that I was heading back to Russia. Once through border control I found a collection of buildings where various people were ready to supply the essential needs of the traveller. Insurance for the bike – one month for RU1,000. Exchange Roubles for Tienge – one Rouble bought five Tienge. That wasn’t a bad rate considering the official one was 5.4 to 1. Good enough until I could find an ATM. A café for coffee and a snack was next, following which I felt ready to see what this new country was going to throw at me. Wondering which of the two different views of the roads I’d received would prove to be the most accurate, I set off for the nearest big town of Atiraw, over 330kms away. Well, the Russian biker who said to fit my off road tyres had a valid point. At first the road was OK but not long after leaving the border it turned to potholed, broken tarmac. I was doing my best to dodge them but it’s never possible to avoid them all. It was giving the suspension a real test and in fairness, Doris handled it quite well. Or so I thought. The rough road went on for about 30kms before it got better, then it carried on with rough/smooth/rough/smooth all the way along. At one point there was a sign saying ‘Uneven road for 30kms’. I thought ‘Why now?’ This was followed by one of the smoothest sections of road so far! The landscape was very bare, mostly sandy and dry. 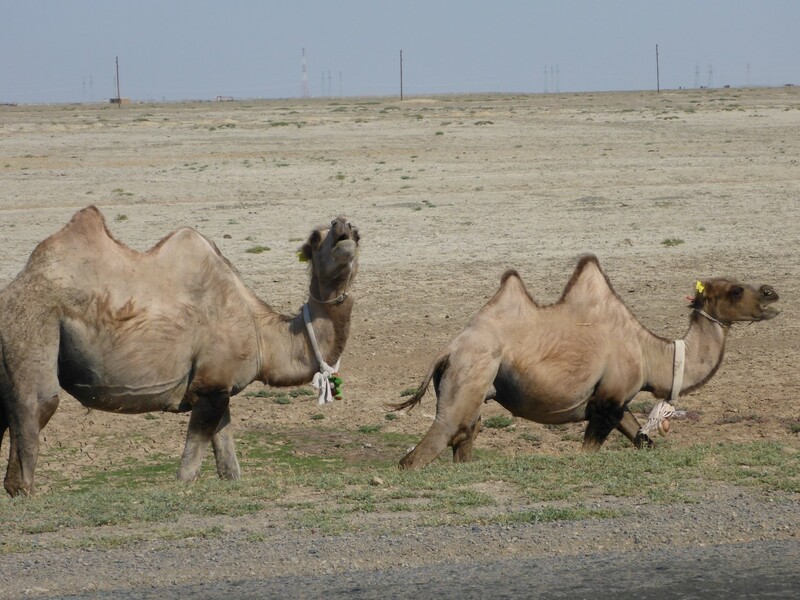 I saw herds of Bactrian Camels. There were a number of villages, some consisting almost entirely of mud huts. Towns were small to non existent. The fields had hay piled up, obviously harvested by hand. They reminded of pictures I’d seen of rural life in the fifties. Oh yes, I nearly forgot to say – it was scorchio! As I neared the point where I was going to have to refuel I noticed that my rev counter was acting up, the needle swinging from one end of the dial to the other. ‘Is a broken rev counter the first casualty of Kazakh roads’ I wondered? When I stopped for petrol an old fella filled it up for me. Not something I normally like but he wouldn’t let me do it. When I’d paid I went to start the bike – no go! The warning lights weren’t coming on so there was clearly an electrical failure. So I pushed the bike into the shade, took off my riding gear, sat down on a piece of wood and ate some lunch while I contemplated. The obvious thing to do was to check the battery connections and the fuse (these older bikes only have one). So I fought my way through everything that was strapped on to the bike and discovered a blown fuse. I replaced it, it didn’t immediately blow again so I reassembled everything. Easy Peasy! I rode round to the café next door, drank a coffee, ate a Snickers and set off. The bike stalled before I got out of the car park because I’d forgotten to turn the fuel back on and what do you know, the same fault. So I pushed it back and did the same repair again. This time the fuse blew before I’d even put the bits back on. OK, time to approach this properly. There was obviously something shorting out and I needed to apply some proper diagnostic techniques which, to be honest, I should have done in the first place. Long story short it turned out that some extra wiring I’d fitted wasn’t as securely fixed as I’d thought. The rough roads led to extreme suspension movement and the tyre had rubbed through this wiring. A proper repair this time had me on the way again. I’m sure the various people who walked in and out of the café wondered what the old foreign fellah was up to, kneeling beside his bike and muttering. At times, so did I! The Road Surface Formerly Known as Tarmac. The time the repair cost me meant I wasn’t going to get to Atiraw that night so I stopped in a small town and asked about a hotel. The message I got was ‘not here but there’s a town about 30km further on that has one’. Good enough for me so I kept on until I reached a town called Aqqistaw. I stopped at a shop to ask a guy who was unloading his van and he seemed to be a bit confused about whether there was one 30km away or 1km. Just then a woman came to the shop, heard what was going on and said ’Follow me’. So I did and she led me to a nice hotel where I got a room. After getting out of my sweaty riding gear I went downstairs and enjoyed a nice meal. Afterwards the receptionist relieved me of T8,000, to cover the room, meal and breakfast, smiling sweetly as she took all my remaining money. 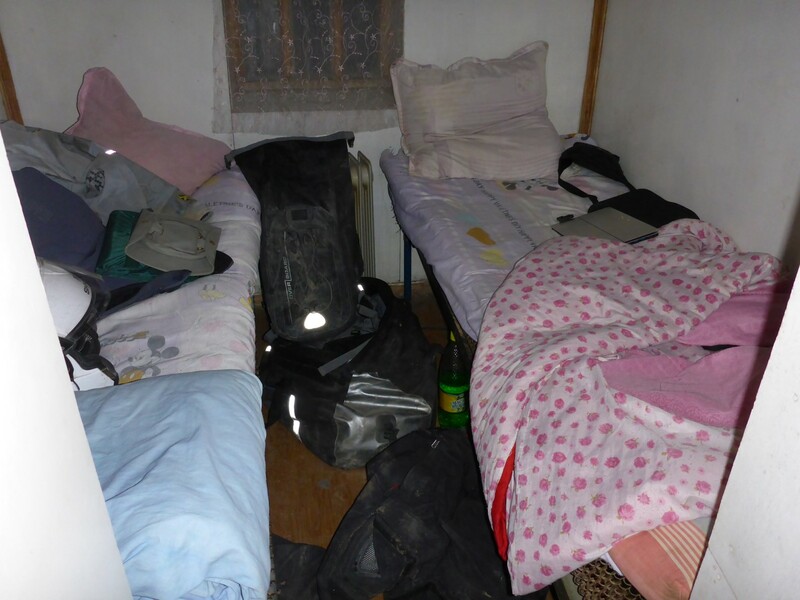 When I arrived in Kazakhstan I’d had the impression that things would be quite cheap so I was a bit shocked by this but when I worked it out, at an exchange rate of about T310 to the pound, it was £25 for an en suite room and two meals. Not as bad as it seemed at first and when I’d arrived I hadn’t asked about or negotiated the price, so I only had myself to blame. But it did seem like a lot of money in a country that sells petrol at 37p per litre. The owner of the hotel insisted I put my bike in the stairwell that led up to the rooms, even though I thought it would be safe enough around the back of the hotel. It was a bit of a struggle but we did it in the end. Local Fauna? A Nodding Donkey. Reflections on my first day in such a different country were numerous. Although Russia has many differences to Europe, and all the countries in Europe have differences to each other, they are all similar in the appearance and the behaviour of the people and the way they live their lives. Kazakhstan takes you outside of this zone of similarity in a big way. Obviously people look different, with a light brown skin colouring and black hair. Facially they start to look more Eastern, probably closer to Turkish than anything else. There do seem to be some slight, probably tribal, differences between some people. But the whole approach to, and nature of, life changes as soon as you cross the border from Russia. A run down of my first impressions goes like this. The north of the country is HOT, mostly barren and undeveloped. Facilities are distinctly third world. Toilets are just a hole in the ground surrounded by a shed, except for in large buildings in towns. Most properties in towns don’t have running water. People have to go to a standpipe in the street, the exception being, once more, large buildings. Outside of towns people seem to scratch a living from the land and some do look very poor. Having said that there are plenty of businesses along the roads. Every petrol station had a café next to it and there was often two of each depending on the need. There are some nice cars around, big 4×4’s very often, so there’s clearly money to be had. In the towns it seemed that everybody had a car, very necessary as they tended to be very spread out. I would often see people at the side of the road thumbing a lift and I learned later that they would happily pay the driver if he insisted. The ‘facilities’ could be described as ‘basic’. But the biggest impression by far was made by my contact with Kazakh people. They are so friendly and, when needed, helpful too. Drivers would toot and wave at me as they went past, the passenger sometimes leaning out of the car window to take a photo. At petrol stations they would come up to me, shake my hand and ask ‘Atkuda?’ Where from? Then ask ‘Kuda?’. Where to? When I told them they seemed impressed. My story would often elicit the question ‘How old?’ And they would then look at me in amazement when I told them. Occasionally someone would be able to speak a bit of English so the conversation would be a bit deeper. I thoroughly enjoyed these moments of contact, feeling that I was getting under the skin of the country a bit, rather than just passing across it. So after such an eventful first day, what would the next days bring to me as I headed south? Well plenty as it happens. However, I’m not going to give a day by day, blow by blow account as that would just take too long and probably bore the pants off you. So I propose to tell you about the highs and the lows. Why bother stating the obvious? I made my way to Atiraw, a sizeable city rather than a town, where I found the now very much needed ATM. I was impressed by the standard of this big commercial centre. The roads were neatly laid out, with flower tubs along the central reservation, and many of the buildings were large, multi storey affairs. Clearly there was a lot of investment taking place. Quite a change from the dusty towns I’d seen so far. It had traffic lights! Something I’d not seen for a while. Like the ones in Russia, these had countdown displays for both drivers and pedestrians, something that’s very useful but that can also act like Grand Prix starting lights. If you’re crossing the road make sure you get to the other side before you run out of time! At over 310 Tienge to the pound,drawing out cash now involved big numbers and some ATM’s don’t give out enough. T10,000 is only just over £30, not much in a cash based economy. With my bank charging me withdrawal fees too, it paid me to draw as much money out as I could in one go so I sometimes had to search for ATM’s that would allow me to draw out T50,000 rather than a measly T10,000. While I was stopped I changed out of my heavy, black riding jacket into a lightweight motocross style jersey, made from mesh but with anti abrasion panels on it. The difference in comfort was incredible and I was much cooler. When I was deciding on what riding gear to use for this trip I decided to buy a special shirt that had body armour built into it and then dispense with the armour in my riding jacket. The idea was that, as now, I could wear an outer layer that suited the temperature and still stay safe. Mid thirties temperatures proved that was a wise decision. The road out of Atiraw was good but I soon came to some roadworks. The road was blocked, and they wouldn’t let me sneak past the barrier, so I was forced onto the diversion route, down the embankment onto a sandy track. I hate riding in sand and to prove it I fell off. Only at low speed and only my pride was hurt, but I struggled to pick the bike up until a passing motorist stopped to help. This system, I was to learn, was the norm at roadworks, so plenty more sandy challenges to look forward to. 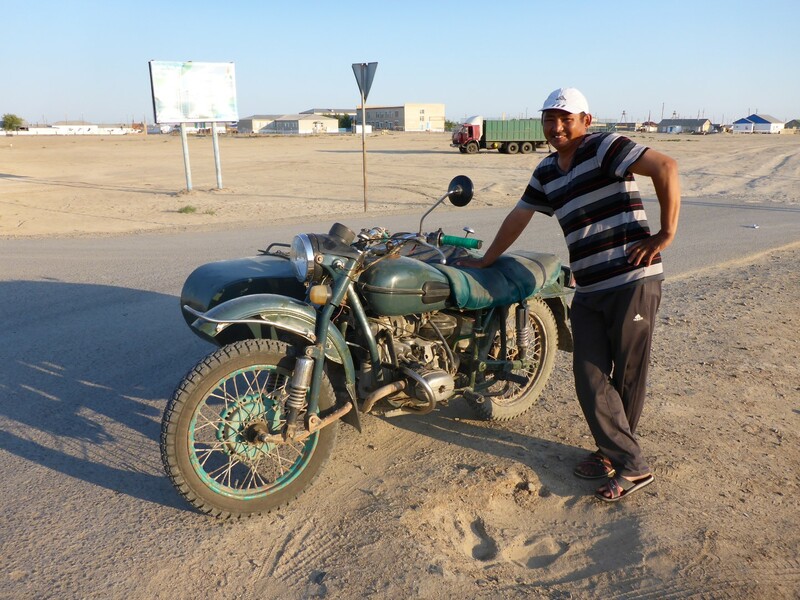 At a lunchtime coffee break in one of the roadside cafés the young lad there gave me some fermented camel’s milk, telling me it was Kazakhstan’s national drink. I was happy to try it and it wasn’t bad. I don’t think I’d chase after it but it was quite drinkable, with a bit of a buzz to it. At the next town I came to the road just disappeared into a maze of dusty streets, something that often happened. Eventually I asked a couple of guys where the road out of town was and they pointed in a direction that seemed completely wrong. They insisted the road looped around so I took them at their word and found that at the edge of town the road just disappeared into the scrub land. 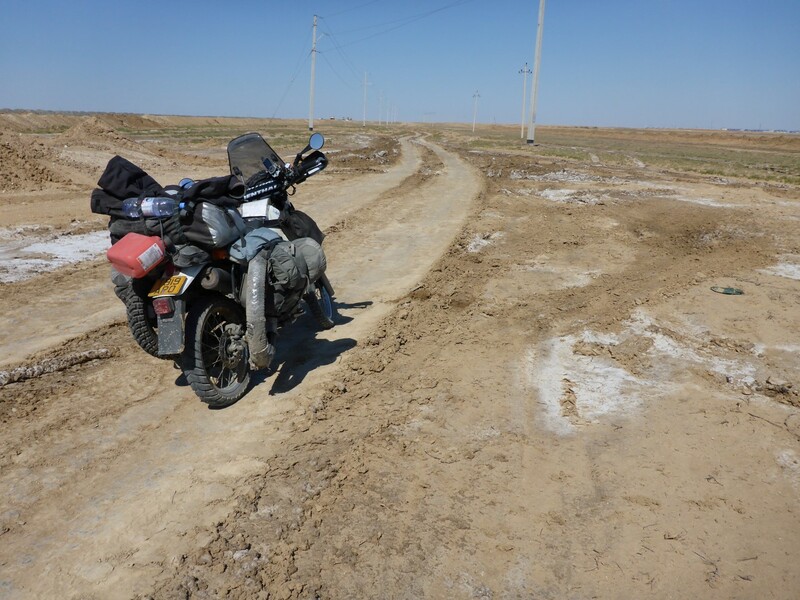 Well, I came to Kazakhstan to follow the road less travelled and here it was, so I rode out, following the twin wheel tracks which, if nothing else, did at least go in the right direction. After a while the track began to run parallel to a raised embankment where roadworks were taking place, clearly the main road I sought. Soon after the track joined this nice new road and I was away. But not for long. The road deteriorated into the ‘Road Surface Formerly Known as Tarmac’ that I’d become so familiar with. And it stayed that way for the next 150kms. Poor old Doris! She took a real hammering. 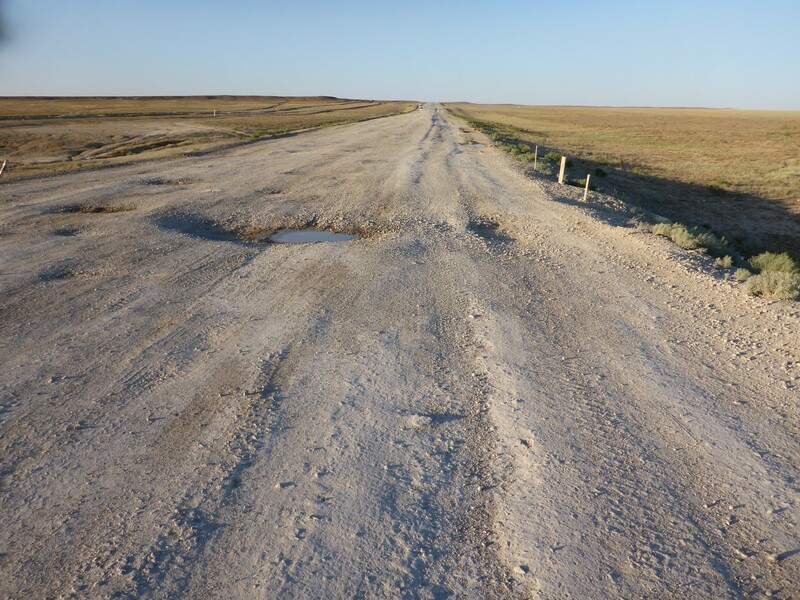 When Kazakh roads get like this drivers usually create an alternative track alongside of the road, sometimes one on each side. After about 100kms I decided to try one of these. I’d been reluctant up to now because of my ‘off’ earlier. Stopping for a drink I decided to check my luggage straps and found, to my heart sinking horror, that one of my bags and slipped out from the straps and fallen off the rear rack. The straps hadn’t been quite tight enough for this super rough road. When I’d put it on earlier I’d ignored my own rule of making sure the securing straps went through the webbing straps on this bag, which would have left it loose but still attached. My horror was because this bag contained my second passport, a significant amount of cash and all my bike documents. This was a disaster! There was nothing for it but to turn back and ride in my wheel tracks as much as possible, hoping to find it. I rode on the wrong side of the road in case it had fallen down the embankment. After about nine or ten kilometres a car coming towards me stopped and two guys got out and were waving my bag at me. 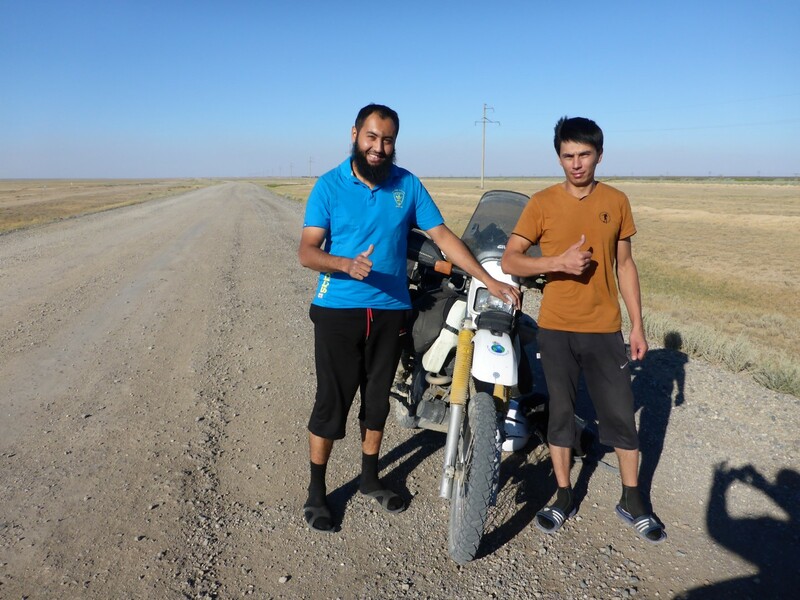 It’s almost impossible to say how pleased I was and how grateful I was to these two young, helpful and honest Kazakhs. They had the sense to check it was actually mine by asking the name in the passport but I’m sure they knew it was anyway. I gave them some money to thank them, which they gladly took and had definitely earned. Kazakhstan is nominally a Muslim country and these guys looked the part, so I wasn’t so surprised at their honesty and anyway, it seemed to fit with my general impression of the people. The milk of human kindness flows deep in Kazakhstan! Now very carefully reattached, my luggage, bike and I carried on along the side track until I half slipped off again in a muddy puddle, but I was able to right the bike and carry on. Until I came to another muddy puddle and dumped it properly this time. Even after removing the luggage I still couldn’t pick it up. I waved at passing vehicles, now all up on the original road, until a trucker stopped and came over to help me, telling me I should be back on the road. ‘But it’s very rough’ I said. ‘This is far worse and you shouldn’t be here’ he gesticulated. Chastened, I reloaded the bike, everything, including me, covered in slimy clay mud and rejoined the main road. Further on I came to a garage and asked about a hotel and he pointed to a place just down the road. This turned out to be some kind of trucker’s overnight roadhouse, which provided food and very small, very basic rooms. A six foot wide cell with two beds in it, but for a fairly small, basic price. I was happy to indulge, especially after the previous night’s financial shock. T2,000 for the meal and the bed. Good enough for me. The young girl who was helping her mother by serving the food spoke a little English but clammed up when I tried to engage her in conversation. Small room but equally small price. Washing facilities at my truck stop hotel. This was a common sight in all roadside establishments. Two days into my journey through this country I’m starting to form some definite impressions. The north West area is a vast, featureless desert. It’s reckoned to be so flat that you can see the curvature of the earth. All I know is that every time you reach a horizon, there’s another one beyond it. The people are not wealthy and the towns are dusty and very spread out. Many of the roads are appalling although there is clearly a massive road building programme under way and, judging by the signs at the roadworks, there’s Chinese money involved in it. A bend is something to be celebrated, just to relieve the boredom of endless straight roads. A hill is unheard of and, at times, so is asphalt. Some of the main roads between towns are stone and dirt. Some routes, as I discovered, have just disappeared into the desert, necessitating long diversions. 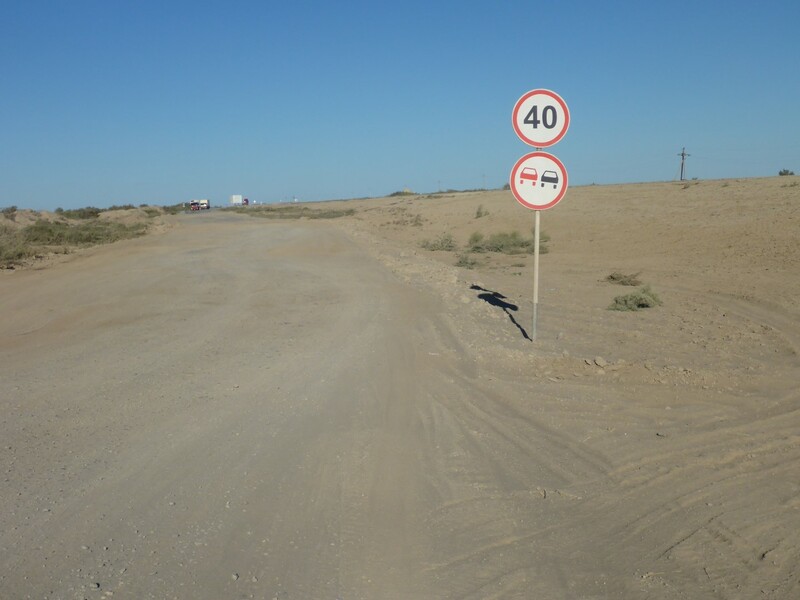 Chinese involvement in the road upgrade schemes. Getting petrol can be good fun or a challenge, depending on your point of view. You can get 80, 92 and sometimes 96 octane. 80 is OK for the ancient Ladas and Urals that many drive. 92 is fine for my bike and most modern cars, 96 is reserved for the rich man’s motor, of which there were a surprisingly large number considering how poor the area is. There is clearly a modernisation programme under way as many of the petrol stations are new, often with mini markets attached. The prices appear to be fixed as there was never any difference from one place to another. T115 was the price for 92 grade and diesel, about 37p per litre. Two Germans I met at one of the petrol stations. As with Russia, you have to pay before you get fuel. You have to either specify how many litres you want and which grade, or just hand over some money and state the grade. The cashier will set the pump accordingly. Neither of these methods worked for me because I always wanted to fill up my tank (it only holds 16 litres) but I never knew how much it would take. So I’d developed the method of giving the cashier more then enough money to fill up and then saying, in my best Russian, ‘I don’t know how many litres’. This was invariably good enough to get the pump turned on and all I needed to do was go back for my change after I’d filled up. Sometimes I had to move my bike off the pump first if there was someone waiting to use it because usually a driver would just get in and go once they’d finished. There had only been two occasions when this system almost didn’t work. One was where the old guy at the cash desk thought he was going to keep my change. I soon ‘changed’ his mind on that score. The second one was where the woman got a bit wound up when I gave her money but didn’t specify how many litres I wanted. Another driver put her straight for me but she had a real moan at me when I went back for my change. She obviously hadn’t heard of the Geoff Method. She has now. I also kept my spare can full as the petrol stations were getting further apart. But one good thing was the invariable presence of a café near the petrol station so refuelling both bike and rider could be done at one place. 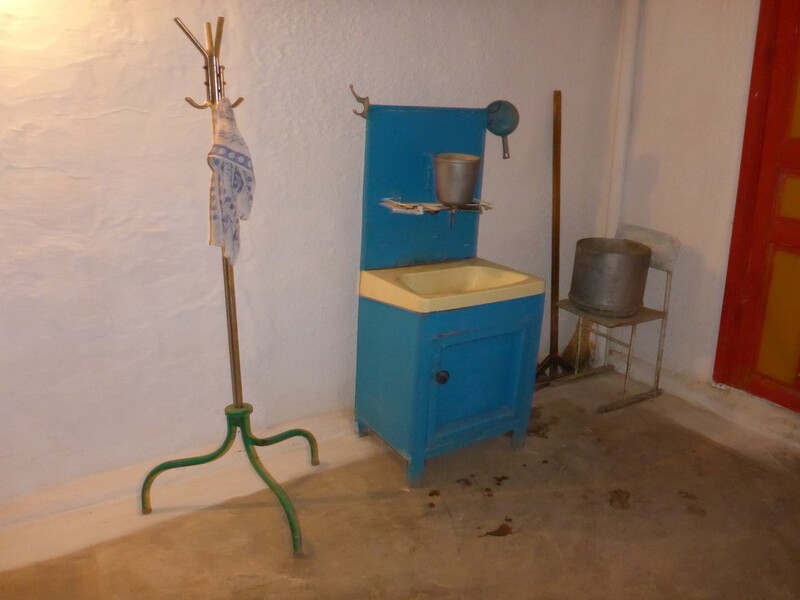 These cafés were very basic but were always clean. The menus were limited but there was always a soup, a main dish and sometimes a sweet, although not often. I usually had Borsch or soup, which invariably had lamb (mutton? ), noodles and veg in it, followed by Plov, Goulash or, if I was really lucky, Shashlik. Along with some bread to go with the soup, one of these meals was all I needed for the day. One thing was for sure, you got to like lamb! Whenever I could I bought some fruit from the roadside stalls that proliferated in the towns and villages and I always had a pack of biscuits in my bag to nibble on. All the shops and many garages sold these in unbranded bags, cheap and plentiful. The other nice snack I discovered was packets of roasted Sunflower seeds. These are really nice and there’s no need to remove the seed from the pod so it’s unfussy to eat. One final memorable event before I close this chapter. 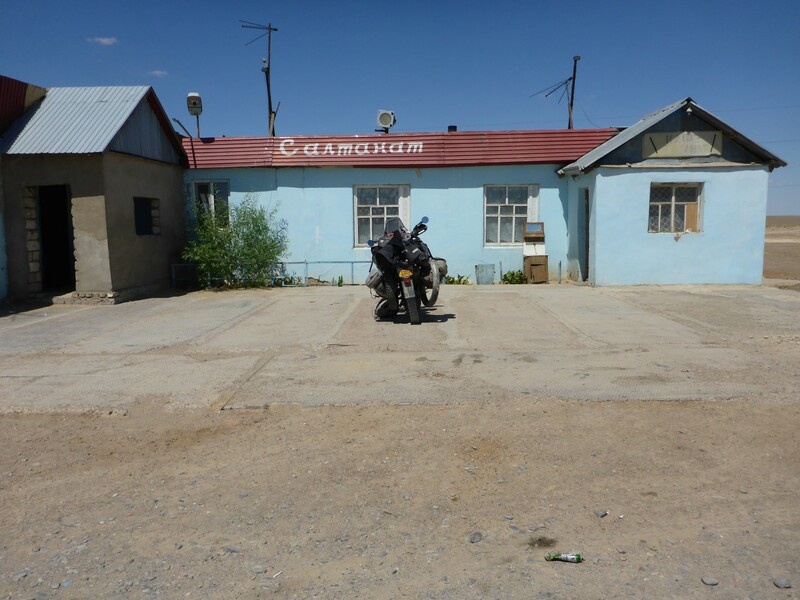 Arriving in a town called Emba, I asked some guys about a hotel and they pointed to a place down the road. It turned out to be a restaurant and was closed anyway. While I was outside wondering what to do a young guy pulled up in his car and wanted to take me to a Banya (Russian style sauna). This wasn’t a pick up line, he was just being friendly to a foreigner. He then invited me to stay at his ‘apartment’ and rang up an English speaking friend to translate for me. In the end he took me to some kind of truck repair yard where his younger and older brother lived in a small building inside. He had a home somewhere else with his wife. To be honest the place was a dump but I wasn’t about to turn down such friendly generosity and it was getting too late to find anywhere else, assuming there was somewhere else to go anyway. These guys were Chechen, and one of them had a phone with a translator programme in it which allowed him to speak into the phone, then show me the written translation of what he had said. I’d never seen this before and it enabled us to communicate quite effectively. I had a decent enough sleep and was grateful to these brothers for their hospitality, especially as I think my presence forced one of them to sleep in a truck. 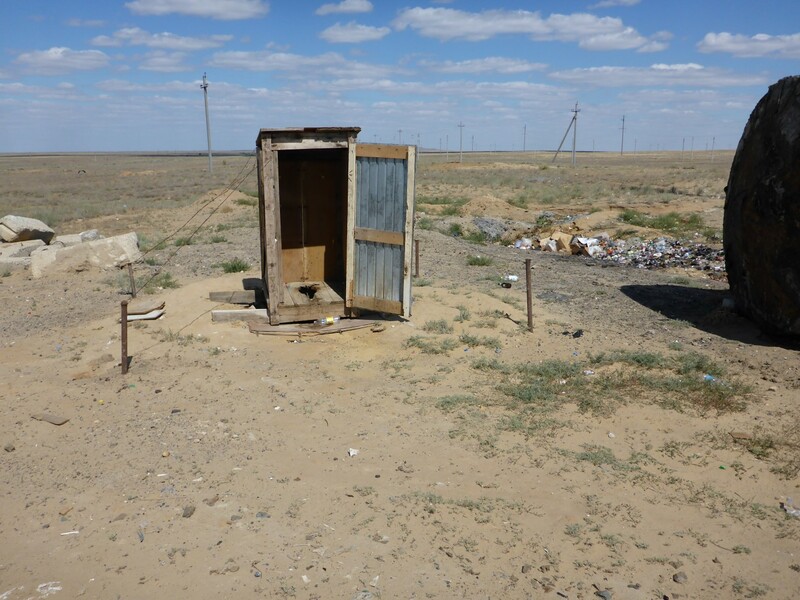 But I was discovering this was typical of Kazakhstan, confirming the view that the less people had the more they often give. 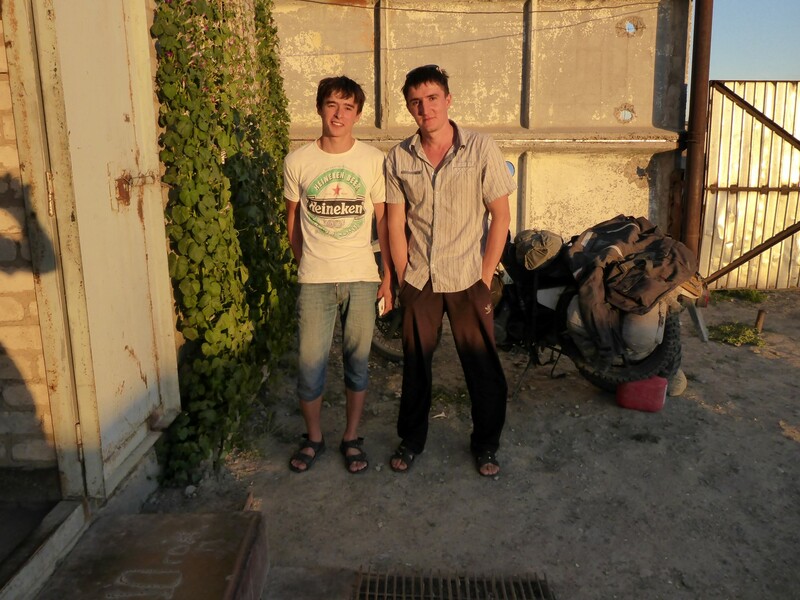 My Chechen hosts, Zaur and Maganed. More to follow soon with a bit of local culture to finish off this section. 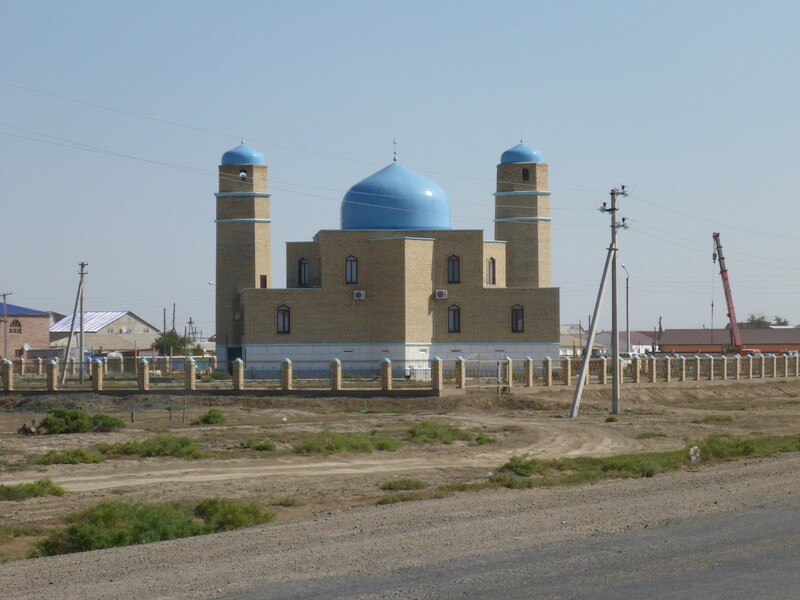 One of the few mosques I saw. Statue celebrating a couple of national heroes. Thanks John, very pleased you’re enjoying them. Yet another interesting blog Geoff. I feel I am travelog with you without the sore bum. Thanks for the wonderful opportunity of travelling along with you, albeit without the sore bum as Paul above very aptly puts it! Thanks Phil, nice to hear from you. 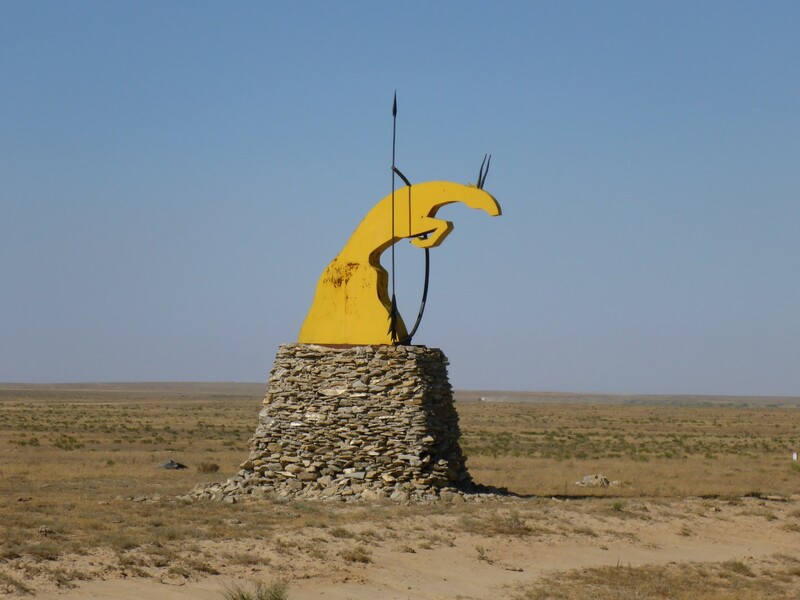 I’ve just posted some more Kazakh tales for you to enjoy, with yet more to come. And you’re right of course, it is definitely the people that make the journey. Sorry mate. That last was from me, Phil.